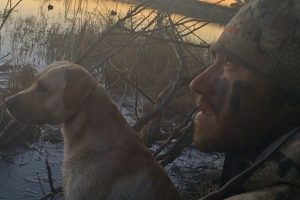 Typically I listen to the local weatherman to find out what kind of weather to expect when I head out to my favorite duck hunting location. I use this information to tell me how I should dress, and make some estimation of how comfortable a day I can expect. However, a recent discussion I had with a hunting guide at the Denver shop of Minturn Anglers gave me some insights about how to use weather forecasts to predict and plan for duck hunting success. He told me that weather conditions affect duck behavior, not just my own. Days which are still, warm and clear can be difficult days for hunting as birds can more easily pick out camouflaged hunters on the ground. On days like this I take careful note of bird patterns throughout the day, what routes they take and when they take off and return. On a next similar weather day I use this information to position myself to intercept these flight and feeding patterns. When storm fronts and cloud cover approach, ducks will move to protected areas, defining and limiting where they are likely to congregate. I try to stay a step ahead, placing a few decoys if time permits, and prepare for this weather driven movement. When it is extremely cold out, I know ducks will be moving to places where water remains open, such as sheltered backwater areas or where currents prevent ice from forming. These are the spots where I often find wall to wall ducks. Foggy weather is the time to use my best duck calls, trying to draw in those unseen mallards. Ducks still en route will be listening for calls they recognize. With snow on the ground, ducks are forced to areas such as cornfields where they can root for seed, or to treed areas where acorns are plentiful. Typically I am there to meet them. Thanks to some friendly advice from Minturn Anglers, I have learned to match my hunting tactics to different weather conditions during the season. Each of my duck hunting forays is successful, no matter what the forecast.